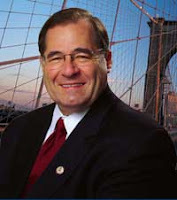 New York Democratic Congressman Jerry Nadler is chair of the House Judiciary Subcommittee on the Constitution, Civil Rights and Civil Liberties. In 2009, while serving in that role Nadler effectively halted a bill to deny Federal funding to the besieged radical "community group" ACORN, on the grounds that it was an unconstitutional "Bill of Attainder". Interestingly, the investigation was driven by Rep. John Conyers, the far left Democrat from Michigan - a man with close ties to the Marxist based Democratic Socialists of America. Strangely, ACORN is very closely tied to D.S.A. and has been for decades. Now it turns out that Rep. Nadler also has close ties to Democratic Socialists of America. So when the D.S.A. connected John Conyers, called for an investigation of D.S.A. connected ACORN, the effort was brought to an halt, by the D.S.A. connected Jerry Nadler. What are the chances? When Nadler served in the New York state legislature in the late 1970s, he was an open and well known member of the Democratic Socialist Socialist Organizing Committee, which merged with former communists and student radicals from the New American Movement to form D.S.A. in 1982. Like President Obama, Jerry Nadler has long been close to Democratic Socialists of America - regularly attending the D.S. A. sponsored annual Socialist Scholars Conferences in New York. At the 1995 Socialist Scholars Conference Nadler served on Panel 1 "Crisis In The City" with D.S.A. honorary chair Frances Fox Piven, co-originator of the notorious Cloward - Piven Strategy of deliberately overloading city and state welfare systems to the point of bankruptcy. In April 1996, Nadler was attended the 14th Annual Socialist Scholars Conference, themed : "Two Cheers for Utopia: Re - imagining Socialism"
Nadler shared a panel with Frances Fox Piven and Stanley Aronowitz of D.S.A entitled "The Left and the Job Agenda in the U.S."
Nadler was also listed as a speaker at the 1997 Socialist Scholars Conference held in March at the Borough of Manhattan Community College in New York. Recently, Congressional Representative Jerrold Nadler briefed D.S.A. activists from around the country on the state of the Social Security situation. According to Nadler, the Social Security "crisis" isn't financial, it's political". The rival Social Democrats USA have alleged that Nadler is an actual member of Democratic Socialists of America. S.D-U.S.A's website history of the U.S. socialist movement confirms the known D.S.A, membership of former Congressmen Ron Dellums and Major Owens, former New York mayor David Dinkins and former AFL-CIO president John Sweeney. The Social Democrats also named Nadler as a D.S.A. member. The Democratic Socialist Organizing Committee merges with the New American Movement, a socialist group that emerged from the New Left, to form the Democratic Socialists of America. To date, three members of the Democratic Socialists of America have served in the U.S. Congress: Ronald Dellums, Major Owens, and Jerry Nadler. Democratic Socialists of America member, David Dinkins, is elected mayor of New York City. John Sweeney, a member of the Democratic Socialists of America, becomes president of the American Federation of Labor-Congress of Industrial Organization. The list excludes another Congressional D.S.A. member, Danny Davis of Illinois. Nor does it include at least a dozen more who have ties to D.S.A., including one of the closest of all, John Conyers. Nadler is a long time member of the D.S.A. created Congressional Progressive Caucus. He also runs on the ballot line of the D.S.A. infiltrated New York Working Families Party. Despite its deliberately innocuous name D.S.A. is a Marxist organization, closely allied to the Communist Party and other radical organizations. Several D.S.A. members have connections to Cuba, while another former National Political Committee member Kurt Stand is currently serving a long prison sentence for spying for the then East Germany and Soviet Union. If one of Mr Nadler's New York constituents would like to write to him asking the question "are you now, or have you ever been, a member of Democratic Socialists of America", I would be happy to either publish his reply, or publicize the lack of.